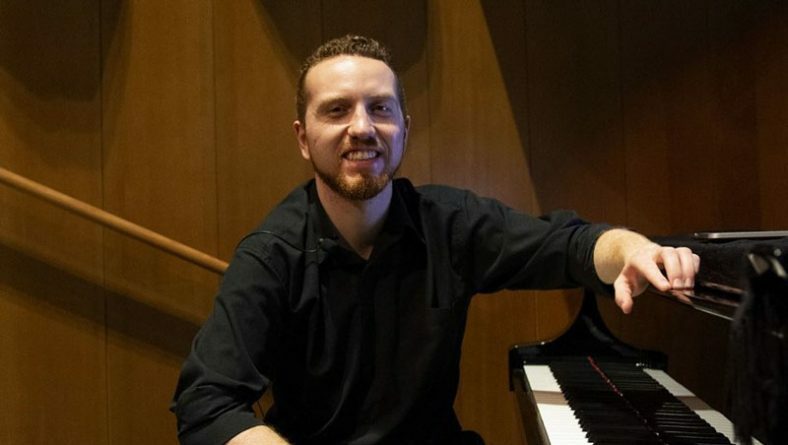 University of Windsor Jazz performance piano major Sam Poole, is boldly taking on all aspects of producing his vision of James Robert Brown’s “Songs For A New World.” It’s not a play, it’s not a musical, it’s Sam Poole’s graduation project as he works towards completion of his Bachelor of Music degree. 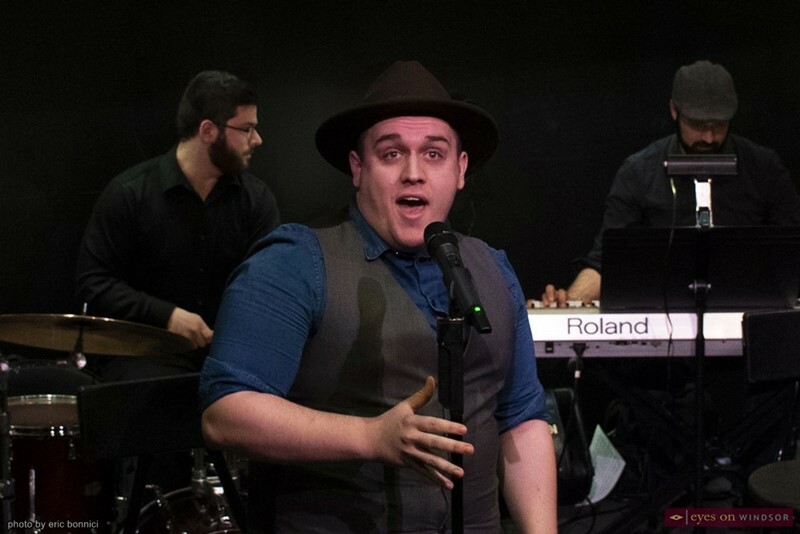 His implementation has brilliantly come together culminating in an exciting theatrical song cycle being showcased to the public for two performances only at the University of Windsor School of Creative Arts downtown campus (Feb. 1 & 2). Rehearsal of Sam Poole’s graduation project, the production of Songs For A New World, at The University of Windsor School of Creative Arts Armouries Building on Wed. Jan. 30, 2019. Photo by Eric Bonnici / Eyes On Windsor. 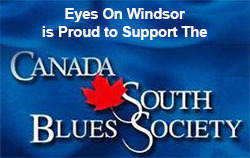 Eyes On Windsor, was invited to attend rehearsal for the show on Wednesday night (Jan 30) , featuring a moving collection of powerful songs that examine life, love and the choices that we make. If Eyes On Windsor was grading Sam’s graduation project we would easily give it an A+. 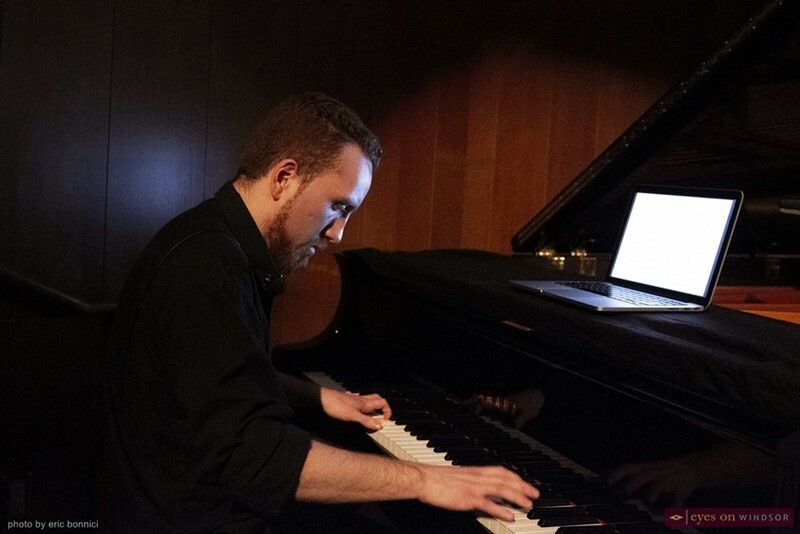 Sam Poole on piano during rehearsal of his graduation project, the production of Songs For A New World, at The University of Windsor School of Creative Arts Armouries Building on Wed. Jan. 30, 2019. Photo by Eric Bonnici / Eyes On Windsor. 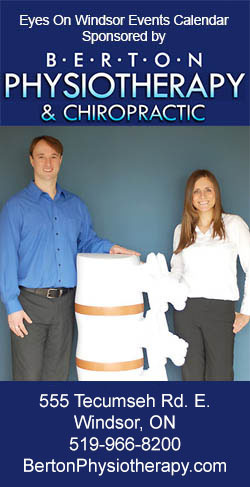 Sam also had to assemble a band and it features many recognizable names including past and present students and Faculty of the University of Windsor. The band includes, Sam Poole, Alex Aideira-Leite, Mike Karloff (Sam’s Pop Jazz teacher), Nicholas Baddeley and Vanessa Harnish (who has been in many shows with Sam). 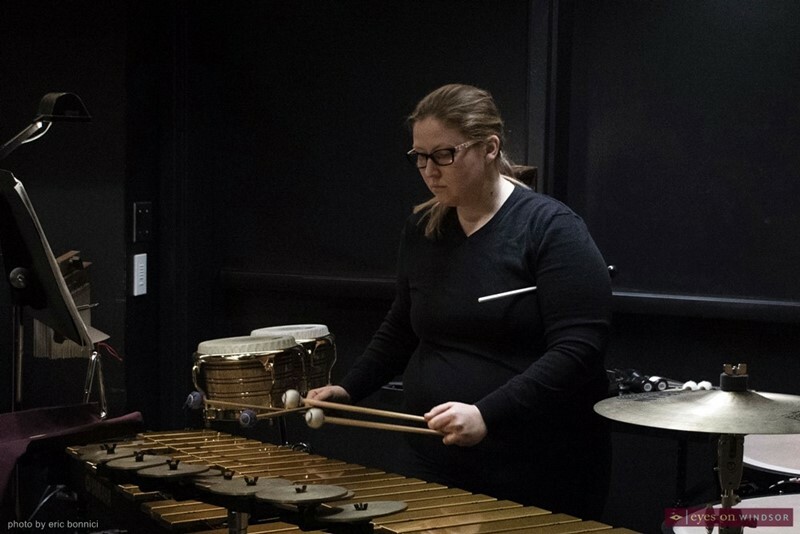 Vanessa Harnish (percussion) during rehearsal of Sam Poole’s graduation project, the production of Songs For A New World, at The University of Windsor School of Creative Arts Armouries Building on Wed. Jan. 30, 2019. Photo by Eric Bonnici / Eyes On Windsor. 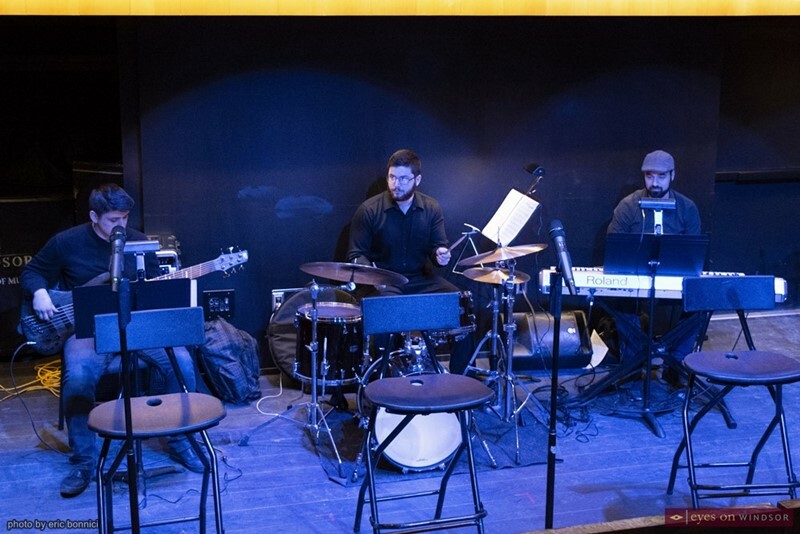 Alex Aideira-Leite (Bass), Nicholas Baddeley (Drums), and Mike Karloff (Keyboards) performing during rehearsal of Sam Poole’s graduation project, the production of Songs For A New World, at The University of Windsor School of Creative Arts Armouries Building on Wed. Jan. 30, 2019. Photo by Eric Bonnici / Eyes On Windsor. The cast includes performers well known to Windsor audiences including Kaitlyn Karns, Benjamin Doncom, Sara Fontaine ,and Michael Roy. “I had to assemble this cast, I had to tell them what to do on stage, i had to tell them about their blocking and their intention in their songs, and I had to rehearse with these guys,” explained Sam. 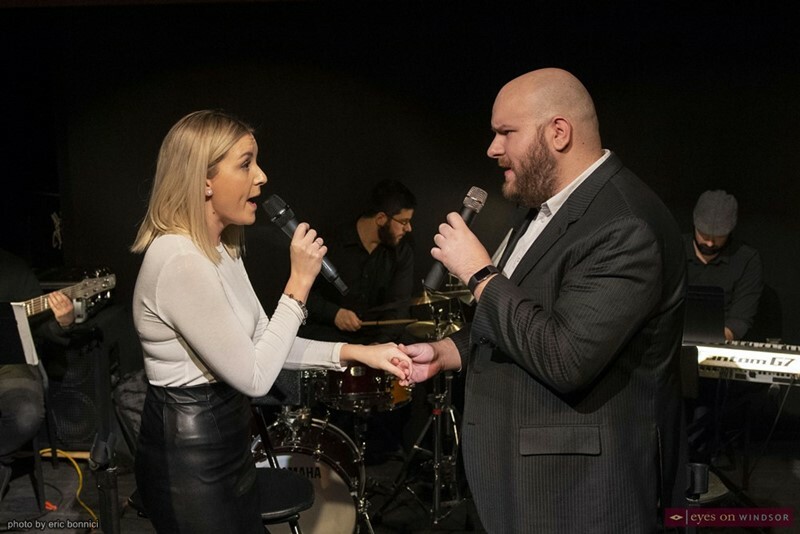 Kaitlyn Karns and Micheal Roy singing during rehearsal of Sam Poole’s graduation project, the production of Songs For A New World, at The University of Windsor School of Creative Arts Armouries Building on Wed. Jan. 30, 2019. Photo by Eric Bonnici / Eyes On Windsor. 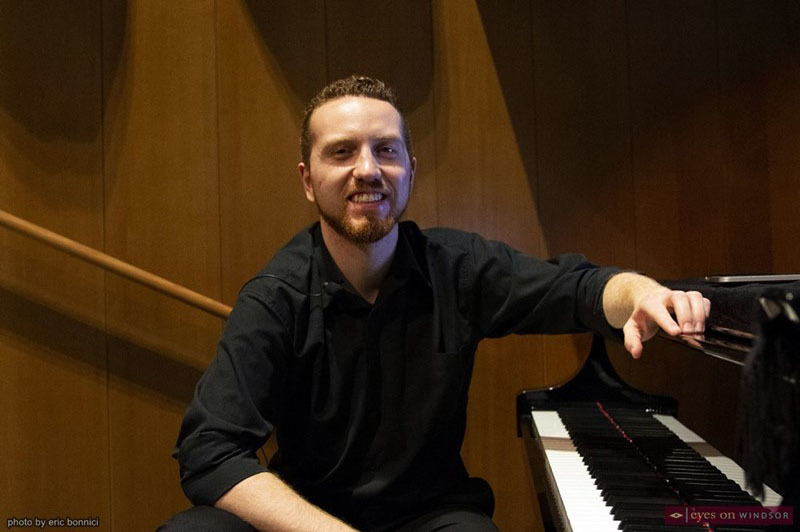 Sam has directed the music for several theatre productions, in fact, among his accomplishments, he wrote the complete musical score for Windsor’s Post Productions’ original Christmas play which debuted last December. 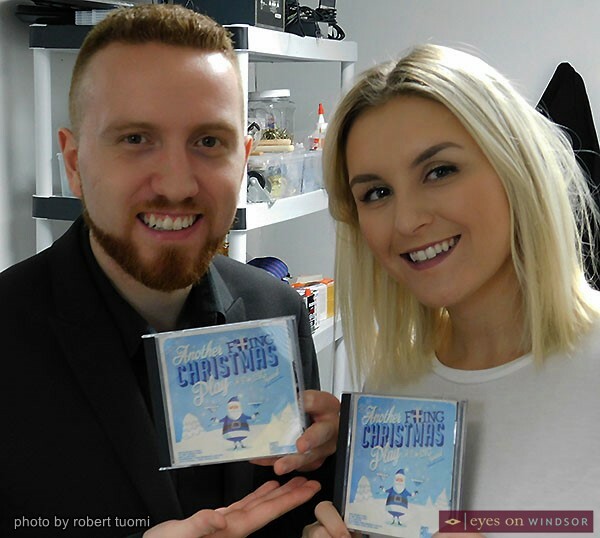 Music director and composer Sam Poole with local actress Kaitlyn Karns show off the original cast recording of Another Fu**king Christmas Play’s eleven original songs. Photo by Robert Tuomi / Eyes On Windsor. “I’ve mostly music directed but because this is a concert I wanted to take up the production and really be involved in the vision,” emphasized Sam. Judging from the stellar singing and music performance during rehearsal, Sam has put together a production able to rival world class professional shows. In addition to directing Sam has performed all over Windsor, Toronto, and Michigan performing pop, jazz, rock, music theatre and more. Sara Fontaine singing during rehearsal of Sam Poole’s graduation project, the production of Songs For A New World, at The University of Windsor School of Creative Arts Armouries Building on Wed. Jan. 30, 2019. Photo by Eric Bonnici / Eyes On Windsor. 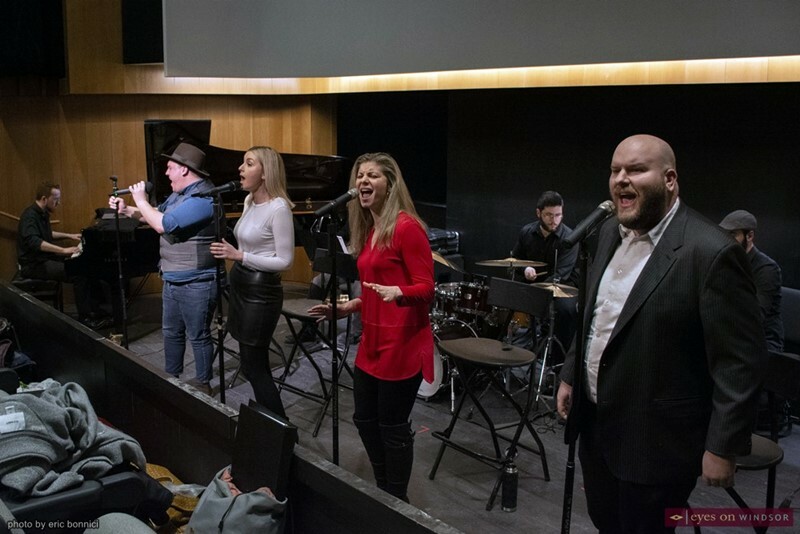 Benjamin Doncom singing during rehearsal of Sam Poole’s graduation project, the production of Songs For A New World, at The University of Windsor School of Creative Arts Armouries Building on Wed. Jan. 30, 2019. Photo by Eric Bonnici / Eyes On Windsor. This contemporary song cycle weaves characters and history together, illuminating the timelessness of self-discovery. “It’s about one moment. It’s about hitting the wall and having to make a choice… or take a stand… or turn around and go back.” These are the stories and characters of today, the Songs for a New World. 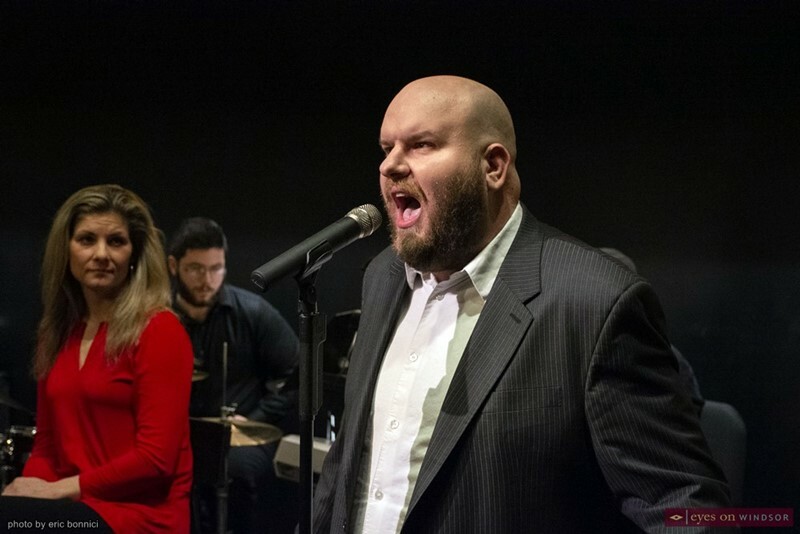 Micheal Roy singing during rehearsal of Sam Poole’s graduation project, the production of Songs For A New World, at The University of Windsor School of Creative Arts Armouries Building on Wed. Jan. 30, 2019. Photo by Eric Bonnici / Eyes On Windsor. 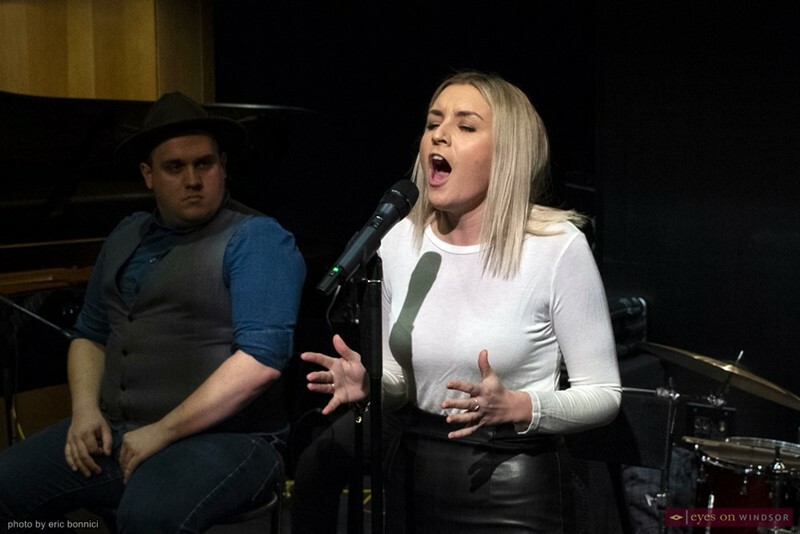 Kaitlyn Karns singing during rehearsal of Sam Poole’s graduation project, the production of Songs For A New World, at The University of Windsor School of Creative Arts Armouries Building on Wed. Jan. 30, 2019. Photo by Eric Bonnici / Eyes On Windsor. 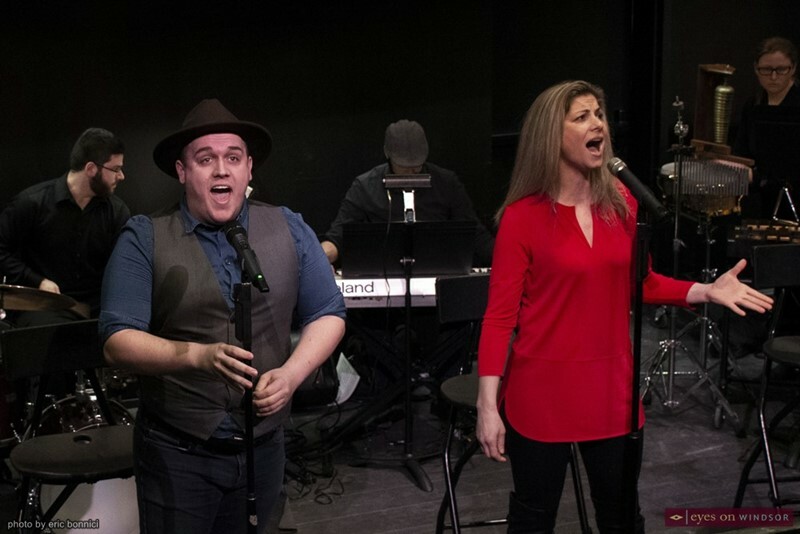 Benjamin Doncom and Sara Fontaine singing during rehearsal of Sam Poole’s graduation project, the production of Songs For A New World, at The University of Windsor School of Creative Arts Armouries Building on Wed. Jan. 30, 2019. Photo by Eric Bonnici / Eyes On Windsor. 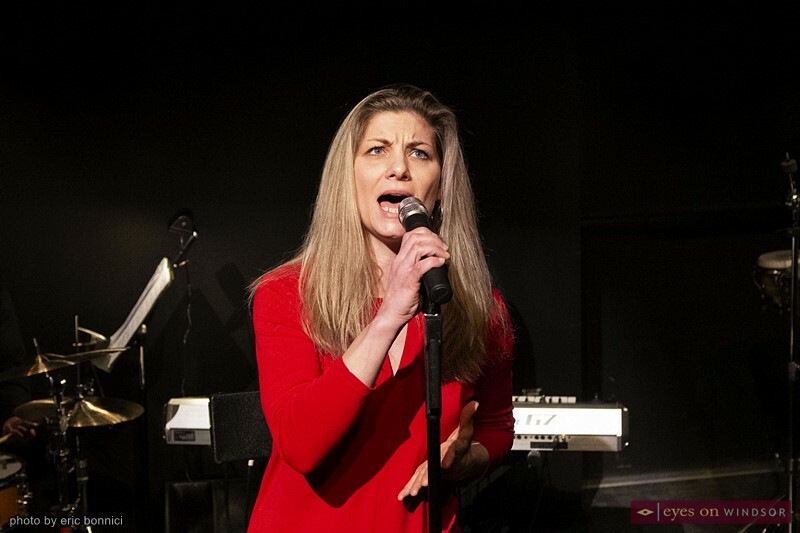 Sam Poole’s production of Songs For A New World runs for two performances, February 1 & 2, 2019 both starting at 8:00PM. 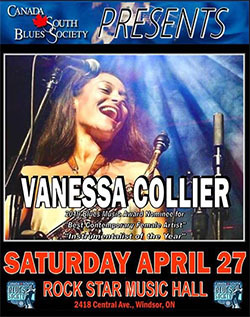 The performances will take place at The University of Windsor’s new School of Creative Arts campus located at 37 University Ave West in the Recital Hall.